Their beautiful dripping white coat whispers Majestic, with their large mane symbolizing a King. Beau is definitely King of our property! Their personalities are calm, focused, intelligent, observant, and sensitive. The ease of training is due to their willingness to please along with their loyalty. The first time you see their fierce protective side, you immediately gain respect for the gorgeous big boned Guardian. In a second, they can return to the gentle loving Giant, they are so known for. 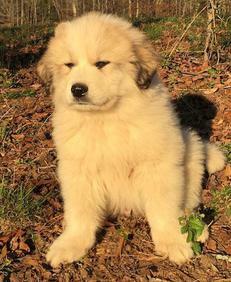 When choosing an LGD, I have learned the key to finding the best LGD is Great parents. I can't say enough about our amazing guardians. They would lay their life down to protect their livestock. All The Belles and Whistles "Belle"
Layla's Cove He's The Man "Beau"
Gabe has been evaluated for hip dyspasia. He was certified "Good" by OFA. 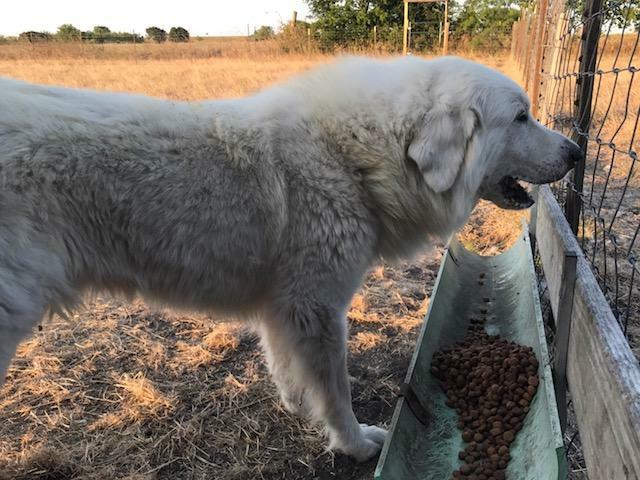 Gabe is an OUTSTANDING livestock guardian. Gabe is extremely watchful. I often observe him at the highest vantage point in his field so he can oversee as much of the property as possible. One of his most valuable qualities is the way he checks each one of my sheep. Gabe will go around and smell each of the sheep. I think he is checking their health. Should he find one that is sick, he will stay close to that sheep. This is often how I locate my sick stock in his field. He is very attached to his sheep. Should I remove one from the field, he will pace the fence and cry for a good day. Gabe is a fierce defender of his flock. One day a large ferrell dog got in the fence. 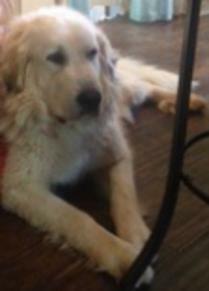 Gabe's battle wounds left him with a large slice in one ear and a mean scar on his muzzle, the ferrell dog was killed. 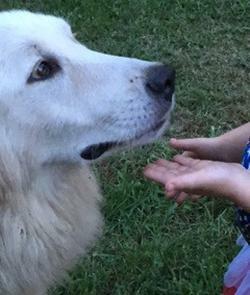 We have never suffered a loss due to a predator since the addition of Pyrenees to our family. Gabe is not only a fantastic LGD, but also a sweet and often playful companion. He is tolerant of being bathed and will do anything we ask him to. He is very affectionate and always trying to get me to pet him when I am in the field checking the sheep. I love the way he bounces around like a puppy when I come to check him and the flock. If that isn't enough, Gabe is a stunning boy! He is absolutely dripping with coat. 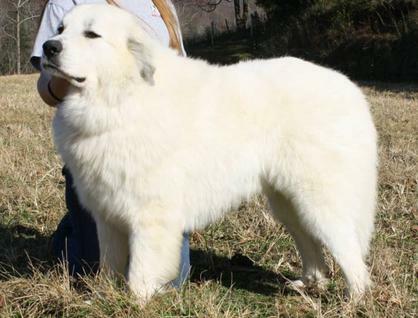 A Tibetan Mastiff would be jealous of his thick coat. His big bear head complements his heavy bone. While Gabe is not from show lines, his excellent, well balanced conformation convinced me to give him a chance in the show ring. Unfortunately, Gabe did NOT enjoy being at a dog show so I quickly dismissed the idea. Gabe has been a fantastic addition to our family and we are blessed to have him. What Gabe's Owner say about him...He reminds me so much of Belle! AKC registered Sierra is the daughter of Sheba and Canuck. She is now what I consider my most effective Guardian. She has been in the field with sheep and learned how to protect her flock by both of her parents since she was 8 weeks old. 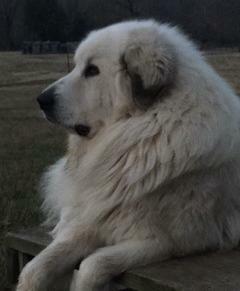 Sierra checks the fence line more often than any of my LGD'S. When I don't find her checking the fence, she will ALWAYS be with her sheep. Wherever they choose to lay down and rest, she will be there with them. She also tends to be the first Guardian to see and respond to fence line threats. Her pedigree is just outstanding! 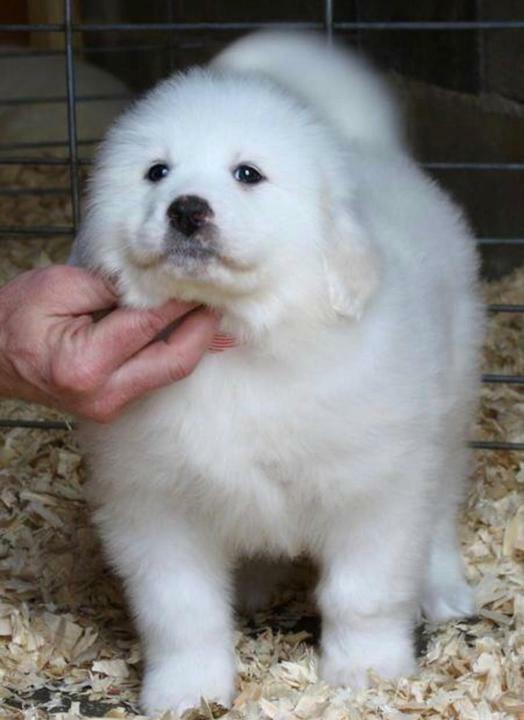 Her Canadian Father, Canuck, is out of Limberlost lines in Canada which is the most successful Canadian Great Pyrenees line in history. Her Mother has Close Rivergroves Champions. Sierra is a very gentle, affectionate, intelligent little girl which makes her an ideal companion. Her intuitive sensitive nature makes her a quick study and she requires very little discipline. Sierra's outstanding show lines paid off giving her excellent structure. Her preliminary OFA texts came back with a grade of EXCELLENT!! Like her mother, Sierra is a solid white and has the best pigment I have ever seen in a solid white. I'm glad to know Sierra is guarding my very valuable livestock. What Sierra's owner say about her..
We imported this amazing boy from Canada. His OFA score was"Good". He has also produced at least one pup that we know of with Excellent hips. Double Champion bred, he has heavy numbers of Champion Limberlost dogs in his pedigree. 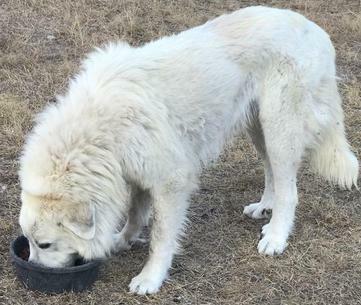 The "Limberlost" kennel is the most successful Great Pyrenees show line in Canadian history and they continue to make new records. 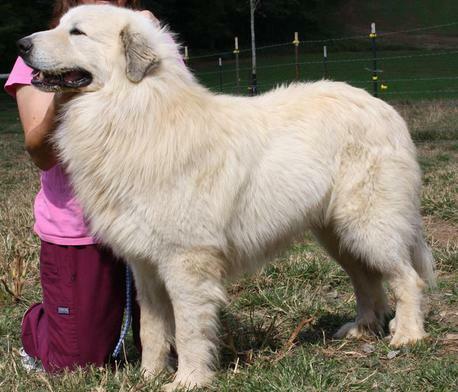 His father, Winningcolors, was the top show Pyrenees in Canada at the time that Canuck was born. Canuck will be starting his show career soon. I'm confident he will finish quickly! Canuck is a powerful and formidable Guardian. He has a huge polar bear muzzle and is dripping with coat. His structure is my favorite quality of his. Watching him move across the field is impressive. He absolutely floats with perfect balance and movement. I'm excited about getting him in the show ring! Puppies in training.. We keep puppies with mama for up to 8 weeks if they have an Adult Guardian at home to train them and 12 weeks if they are your first puppy! If you want your puppy trained longer, arrangements will need to be made prior to putting down a deposit. 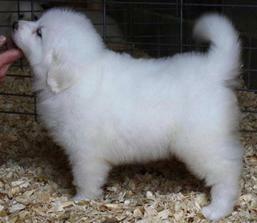 All puppies sold with full breeding rights. 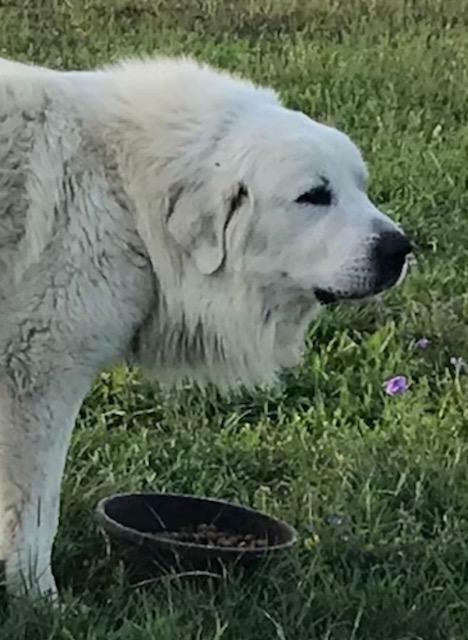 Layla is such a sweet, loving, loyal girl.. Layla is our all around family & farm guardian, while she mostly lives inside our home and has always been the perfect lady. Layla would lay down her life for any of her family members! What Layla's Owner say about her..
was born here on our farm and has been such a blessing to our family and lifesaver! At 6 mo of age he went through his 1st kidding season and has been amazing :) he had everyone cleaned up by time we got home from work, moms & kids!! He has been through hens hatching out there chicks and haven't lost not one due to predators! Lets just say he has done more than earn his keep!! Such a amazing BOY!! This big boy is the whole package!! We have owned goats since 09' and never had any issues with coyotes until 3 yeas ago. When you let your guard down, they will come! We lost 4 does in one night. At the time, we had a donkey, that did nothing. I was so mad at myself for not investing in a good LGD, to guard my precious mini nubians. My friend in AK. offered to loan me her boy, Beau, I knew the Coyotes would be back and wipe out my whole herd. Beau came to Texas and he's been such a blessing to our herd. Beau trained Belle and Stella my 2 girls. He has these soulful eyes that are so sincere. He's such a gentle giant! Beau likes to sit up high to view all the goats. 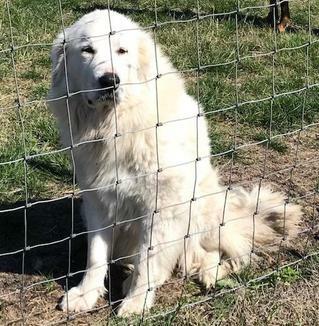 He lets Belle guard on the front lines with him, but has taught Stella to stay back with the goats. He is constantly walking the fence line and always on guard! Belle and Beau love to bring their treasures in the middle of the field and they're so proud to show me what they've killed! When my friend offered to sell him to me I didn't think twice..YES! My goats are safe with him on Guard!